Dr Scott McIntyre studied French Horn at the Victorian College of the Arts in orchestral performance and composition from 1988-90, before continuing studies with Brenton Broadstock and graduating with a Bachelor of Music in music composition from the University of Melbourne in 1993. During his time at Melbourne University he was acknowledged, in 1991, with a Highest Commendation in the Paul Lowin Orchestral Award for his Symphony for Large Orchestra. 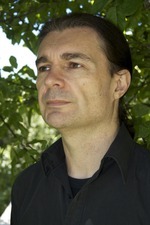 He attended the National Orchestral Composers School in 1993, the Adelaide Symphony Orchestra performing his work Infinity Has No God under the direction of David Porcelijn. With much experience in orchestral performance, he shows confident orchestration while adhering to strict architecture in his music. He is interested in the planned detail and development of melody and harmonies to create a modern polyphony that fuses his interest in medieval music through to orchestral music of the 20th and 21st centuries. In 2009 his String Quartet No.1 was performed at the Asian Composers League Festival in Tongyeong, South Korea. 2012 saw the premiere of Constellationsim II by the Israel Chamber players in Tel Aviv for the Asian Composers League Festival, and the concert performance of his opera, Fire on the Snow. He completed his Masters Degree in Composition at the University Of Melbourne in 2009 and his PHD in Composition at the University of Tasmania with the assistance of an Elite Scholarship in 2013. His music has been performed and recorded in the United States, Europe, Asia and Australia by artists such as Michael Kieran Harvey, Barrie Webb, Brigid Burke, the Arditti String Quartet, Silo String Quartet, the Israel Contemporary Players and the Tasmanian, Adelaide and Melbourne Symphony Orchestras and the Brno Philharmonic. In 2012 he attended the Composing in the Wilderness workshop in Denali National Park, AK as part of the Fairbanks Summer Arts Festival. In 2014 he was awarded the first prize in the Jean Bogan Prize for Piano Composition for his piano work A Universal History of Infamy (Piano Sonata No.2) which he wrote for Michael Kieran Harvey. Piano sonata No.3 (solo piano) (2016) Commissioned by Michael Kieran Harvey. - Program note: Scott McIntyre's "Cenozoic"